Hojusan Jizoin Enmeiji Temple belonging to Buzanha in Shingon Sect was built in 1596 in Shinyo Hoin, it was soon after Ieyasu Tokugawa had moved to Edo. And there are many stone statues of Buddha dedicated in Enmeiji Temple, especially a Jizo called 'Kubikiri Jizo (decapitated Jizo)' or Nene Zuka is famous. Moreover, Hojusan Jizoin Enmeiji Temple is the 28th of the 33 Pilgrimage in Gyotoku and Urayasu. Why don't you visit Hojusan Jizoin Enmeiji Temple? Hojusan Jizouin Enmeiji Temple was built in 1596. It belongs to Buzanha in Shingon shu. 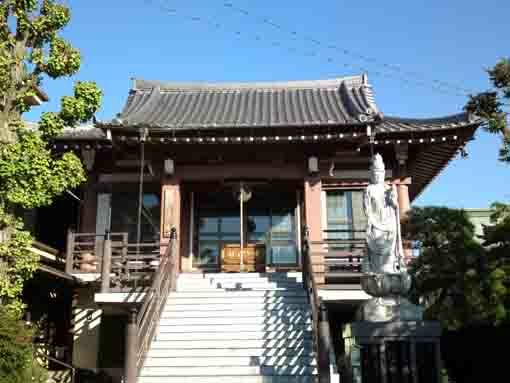 It is a branch temple of Zenyoji Temple in Edogawa-ku, Tokyo. The principle image of Enmeiji Temple is the statue of Kongokai Dainichi Nyorai (Dainichi Nyorai in Vajradhatu). And the main hall of it is rebuilt in 1981. A couple of elopers, Ine and Kyuzaburo, and ferry men helping them were crucified at Imai on the opposite bank of Edogawa River in 1644 since they had broken the law that women were forbidden cross the river by ferry. To hear their poor story, people dedicated a stone Jizo on the bank near Arai Sluice Gate now standing for the repose of them. This Jizo has been called 'Kubikiri Jizo (decapitated Jizo)'. In 1795, the chief priest of Enmeiji Temple rebuilt it and the Jizo was moved to Eneiji Temple later. 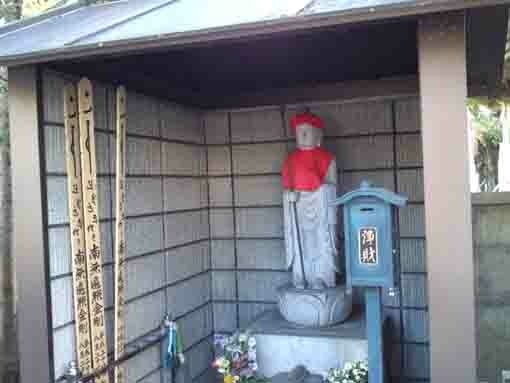 The Jizo now standing was rebuilt in several decades ago. Besides, there was Arai Elementary School opening at Enmeiji Temple in 1874, and it was the forerunner of Arai Municipal Elementary School. 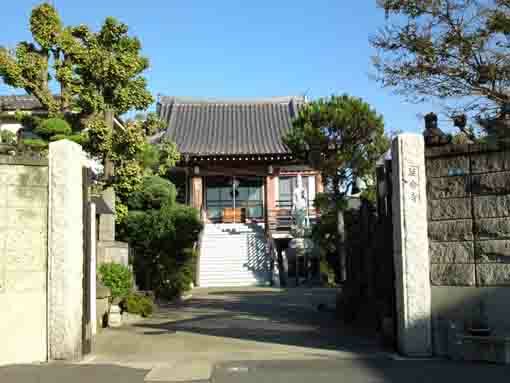 Then it was called 'Otrera no Gakko (a school in the temple) and there were 34 boys, 13 girls and 1 teacher studying in it at that time. Kubikiri Jiao was originally standing near Arai Sluice Gate now standing and it was called Nenezuka (the monument of Nene). Nenezuka was for the repose of a couple of elopers, Ine and Kyuzaburo. In 1644, they were retainers of Hanya Morikawa controlling Oyumi Han in Shimousa and they loved each other and they were escaped to Edo to live together. Ine and Kyuzaburo tried to cross Edogawa River by ferry at Imai, but they were arrested by the officers of Edo Bakufu. Ine, Kyzaburo, ferry men and his wife were crucified at Imai as a warning to others. The ferry men and his wife were buried in their family temples. However, Ine and kyuzaburo were buried in the bank near the gate. To hear their poor story, people dedicated a stone Jizo on the bank for the repose of them. It was mysterious, the head of the Jizo had to be fallen down on the ground when villegares past it, even if they stuck it on the body with cements again and again, it could be fallen. Therefore they called it 'Kubikiri Jizo'. 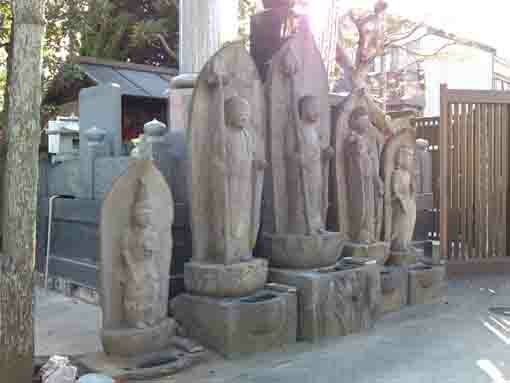 The Jizo now standing in Enmeiji Temple was rebuilt by the supporters and the chief priest of Empeiji Temple. Hojusan Jizoin Enmeiji Temple has a great accessibility from both Narita and Haneda International Airport.